How do I refresh my Airbnb property list? You've added some new listings to your Airbnb account and need to refresh the list in Tokeet? Here's how. If you've added new listings to an existing Airbnb account, you may notice that these new listings do not automatically show in Tokeet. Don't worry, refreshing your Airbnb property list is easy in Tokeet. In Tokeet, navigate to "Channels"
Click the "Refresh Room List" option. That's it! Now you will see the newly added listings show in your connection list. Simply link these listings to the appropriate Tokeet rental and you're all set. If you want to create new rentals by importing them from Airbnb, you may easily do so as well. 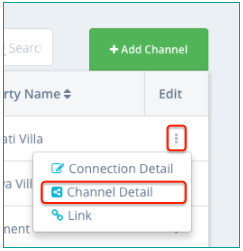 On the Airbnb Channel Detail page, scroll down to connections where Linked Rental is "none"
Click the edit (three dots) icon to the right of it and select "import property"